The countdown has begun……only days until Father Christmas pays a visit to the Wickford At Christmas Street Fair on November 25. Santa has been busy getting everything ready for his trip. He is pleased to report that his sleigh has just passed its annual MOT (with ‘flying colours’ of course!) and his reindeer are chomping at the bit in readiness for their long journey to Wickford. Santa’s travel expenses from the North Pole are being covered by Bourn Hall Clinic which is delighted to be helping to sprinkle some early Christmas magic over Wickford. Christmas is all about families and can be particularly difficult for those struggling to conceive. Bourn Hall’s brand-new purpose-built Wickford clinic opened to patients earlier this year and we are looking forward to welcoming the first babies in 2019. 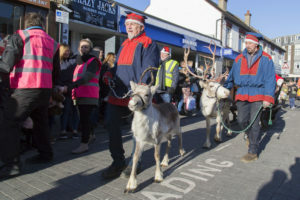 The clinic has fast become an integral part of the local community and we are delighted to be supporting the Wickford At Christmas Fair for the second year running. Santa is looking forward to meeting the countless excited children and their families who are expected to visit him in his grotto at D Glick (Eye Clinic) Opticians. See you there!